We have some exciting news! The 2016 Wedding Spot Awards were announced today, and Granite Creek Vineyards has been named as one of the Best Wedding Venues in Arizona out of over 8,000 venues! We are absolutely delighted to be selected and are extremely proud to be recognized by millions of couples and Wedding Spot, as a top venue! 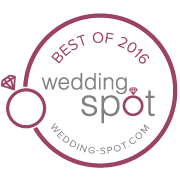 Check out our feature on the Wedding Spot Award Winners page http://www.wedding-spot.com/awards/best-wedding-venues-2016/ ! This honor underscores our commitment to providing a wonderful wedding experience to our guests and helping them build their dream event with family and friends, on the biggest day of their lives. We look forward to continuing to uphold our high standards of events and services and to working with you! We appreciate your support, and can’t wait for the incredible year ahead! Next Post Who’s Ready for Spring? Hi Jim, our Live Music is starting this coming Saturday March 25th! Check the ‘Events’ page for a full calendar of upcoming events and music. Hello Tatiana, I would love to set up a meetign with you! Email me directly to heather@granitecreekvineyards.com and we’ll find a time.